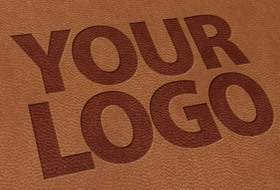 Your logo or design is reproduced using a series of stitches, layers and colours. The larger the logo the more stitches and time it takes to embroider. 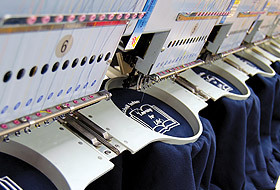 Our machines can embroider multiple garments at the same time allowing us to fulfil larger orders. The colours in the logos and designs will be matched as closely as possible to a range of thread colours available. 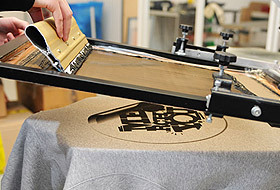 Screen printing is a popular method of printing larger designs onto garments. It is ideal for designs with large areas of colour. Due to the set up costs in creating the screen, it is suitable for medium to large runs. The method uses ink pushed through a fine mesh containing the design. Each colour required is applied one at a time, this is because a different screen is required for each colour in the design. This means that the cost for screen printing rises with the amount of colours used. This form of personalisation is ideal for low quantity runs. Your design is either digitally printed onto a transfer paper or machine cut from a heat reactive flexible material. This is then put into position on the garment and placed under a heat press. 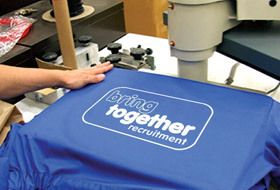 The heat transfers the print or material on to the garment. The process requires that you have a metal block made from your design or logo. The cost for this depends on the size of the block required. This block is fitted to one our specialised blocking machines. The product is placed into the machine and block is pressed into its surface with the addition of heat. The process indents the design into the surface of the products. The heat applied can also help the effect by slightly darkening the product material. 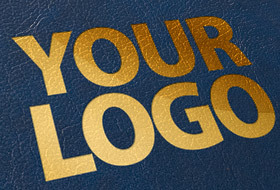 This technique is similar to blind embossing in that it uses the same process of creating a metal block of your design or logo. The block is fitted to the blocking machine and the product is placed into the press. A small sheet of foil is put between the product surface and the metal block. Pressure and heat is applied and the foil is transferred onto the surface of the product. The foils available range from metallics such as gold and silver to brighter solid colours.